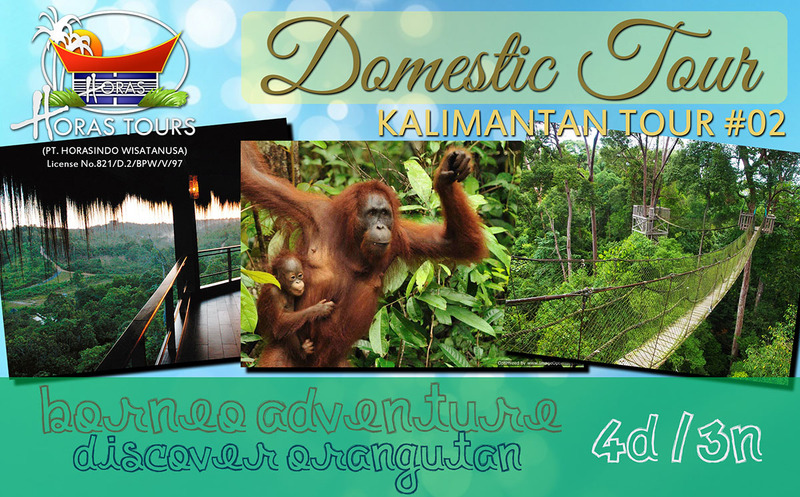 Kalimantan Package 2 Duration: 4D-3N "No blackout dates" BORNEO ADVENTURE - DISCOVER ORANG UTAN Get in touch with Mother Nature and the wonderful lives within in our special Borneo adventure journey. Meet the friendly and highly intelligent Orang Utan and marvelous Sunbear at Samboja Lodge and venture the rich rainforest by the Wain River and Bukit Bangkirai. Brace in the heartwarming discovery of Borneo’s rich flora and fauna with us! DAY 01: WELCOME TO SAMBOJA LODGE Balikpapan – Samboja Upon arrival at Balikpapan airport, our guide will welcome you and take you on a 1-hour drive to Samboja Lodge. Surrounded by lush vegetation, this eco-lodge is known for their effort in rainforest and wildlife preservation. Enjoy your free time at the lodge. Walk around the compound and observe the Orang Utan or try out one of nature preservation activities available on the lodge. You can even plant a tree and track the progress through the web! DAY 02: MEET THE ORANG UTAN Samboja Lodge - Bukit Bangkirai After breakfast, gear up for the fun soft trekking journey. Make sure you are wearing sun protected outfit, sunscreen and secure shoes for the trip. We will begin trekking around the lodge to observe the Orang Utan as well as the Sun bear. Borneo Orang Utan Survival Foundation (BOS) has been actively preserving Orang Utan in Samboja Lodge since 1992 and released over 200 Orang Utans to 6 islands around the lodge. After lunch, another soft jungle trekking awaits in Bukit Bangkirai where you can observe the wonderful Borneo rainforest as you walk through the breath-taking canopy bridge that is over 50 meter above ground! If we have enough time, we’ll take you for a quick canoe trip at Sungai Hitam to see proboscis monkeys. DAY 03: JUNGLE TREKKING Samboja Lodge – Wain River - Balikpapan The awaited trekking to the heart of Borneo is here today. Load up your energy with healthy breakfast from the lodge and check out. We will drive you to Wain River and begin 4 hours trekking to explore the pristine jungle and observe the wildlife. You will also get to see the famous carnivorous pitcher plant among many other diverse floras in the rainforest. After trekking, we will take you back to Balikpapan for hotel check in DAY 04: SEE YOU AGAIN Balikpapan Enjoy your free leisure time today. Take a look around the town or relax at the hotel before our guide picks you up for your flight departure.